Welcome to the SEND department at Ash Manor School. We are committed to a policy of inclusion in which the teaching, learning, achievements, attitudes and well-being of all students matter – including those identified as having special educational needs. The management and deployment of the school’s resources are designed to ensure that all students’ needs are met. Every teacher is considered a teacher of SEND and the school aims to meet the needs of all students, including those with special educational needs. The department follows the current SEND Code of Practice and this has been shared with all staff and parents. · There is a greater focus on support that enables those with SEN to succeed in their education and make a successful transition to adulthood. · Liaising with external agencies including the Local Authority’s Multi-Professional Team, health services and voluntary bodies. · Has a significantly greater difficulty in learning than the majority of others of the same age, or 16. · Has a disability which prevents or hinders him or her from making use of facilities of a kind generally provided for other of the same age in mainstream schools or mainstream post-16 institutions” (SEND Code of Practice, 2014). In addition, educational settings should examine carefully all aspects of a child’s learning and development to establish whether any delay is related to learning English as an additional language or if it arises from SEN or disability. Difficulties related solely to learning English as an additional language are not considered SEN.
1) Communication and Interaction: includes children and young people who experience difficulties in speech, language and communication with others. This may range from difficulty understanding instructions or lacking the ability to understanding or using social rules of communication. The profile for every child with communication and interaction needs is different and it will constantly change with individual’s development and time. Recognised needs within this area include speech, language and communication needs (SLCN) and needs relation to Autistic Spectrum Disorder (ASD), including Asperger’s Syndrome. 2) Cognition and Learning: includes learning difficulties which result in children and young people progressing at a slower rate to their peers, even with appropriate differentiation. Recognised needs within this area are hugely varied including moderate learning difficulties (MLD) and specific learning difficulties (SpLD) including a range of conditions such as dyslexia, dyscalculia and dyspraxia. 3) Social, Emotional & Mental Health: child and young people may experience a wide range of social and emotional difficulties throughout childhood which manifest themselves in many ways. This may result in a young person becoming withdrawn or isolated, displaying challenging behaviour, experiencing anxiety or depression, self-harming or other physical symptoms that are medically unexplained. Other recognised needs within this area include attention deficit disorder (ADD), attention deficit hyperactive disorder (ADHD) or attachment disorder. 4) Sensory and/or Physical needs: some children and young people require special educational provision because they have a disability which prevents or hinders them from making use of the educational facilities generally provided. Children and young people with a physical disability (PD) may require additional ongoing support and equipment to access all the opportunities available. Other recognised needs within this area include vision impairment (VI), hearing impairment (HI) and a multi-sensory impairment (MSI). · Observation and feedback from support staff and external agencies. In line with new government legislation as set out in the New Code of Practice (2014) and Surrey County Council (The Right Provision at the Right Time, April 2014), the school makes a judgement about the appropriate stage of each student on the SEND Register. Parents are encouraged to seek advice from the school or Local Authority for further information. · School Action and School Action Plus have been replaced by a single coding catering called SEN Support. This is sometimes displayed as a ‘K’ on SEN documentation. · The Code of Practice (2014) advocates that the majority of students identified as having SEND will have their needs met through high quality inclusive teaching. · Statements of Special Educational Needs will be replaced by educational settings within three years with Education, Health and Care plans. · All new successful applications for Statutory Assessment will result in an Education, Health and Care plan being granted. 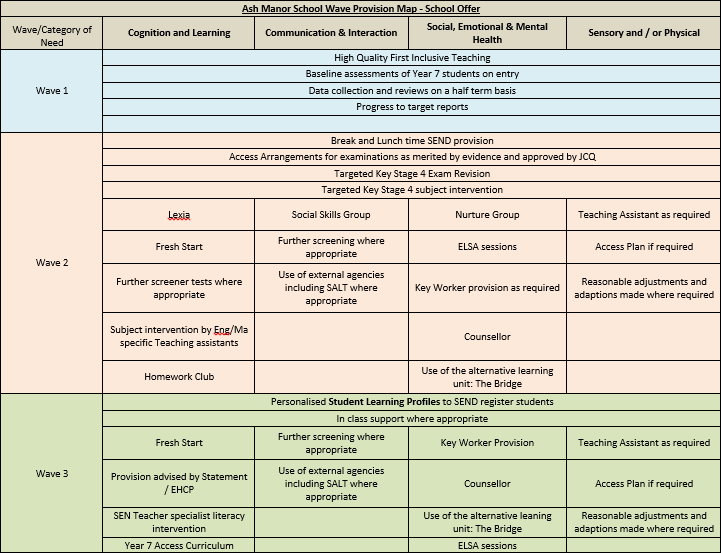 In line with the Code of Practice (2014) recommendations, Ash Manor School follows the assess, plan, do and review framework to support the educational provision for students identified on the SEND register. · Assessment: Includes identifying the SEN support required to meet the need of the child/young person by carrying out an analysis of the child’s needs. This is done in collaboration with parents. · Plan: Where it is decided a student is to be placed on the SEND register, appropriate levels of SEN support needs to be agreed with associated outcomes. The school formulates a plan in order to meet the needs of the child or young person. · Do: Teachers remain responsible for the progress and outcomes of identified SEND pupils within their individual lessons. However it is the responsibility of the SENCO to co-ordinate the provision and interventions of students with identified SEND. When appropriate, the SENCO should advise staff on strategies and guidance on how to meet the needs of the pupils. 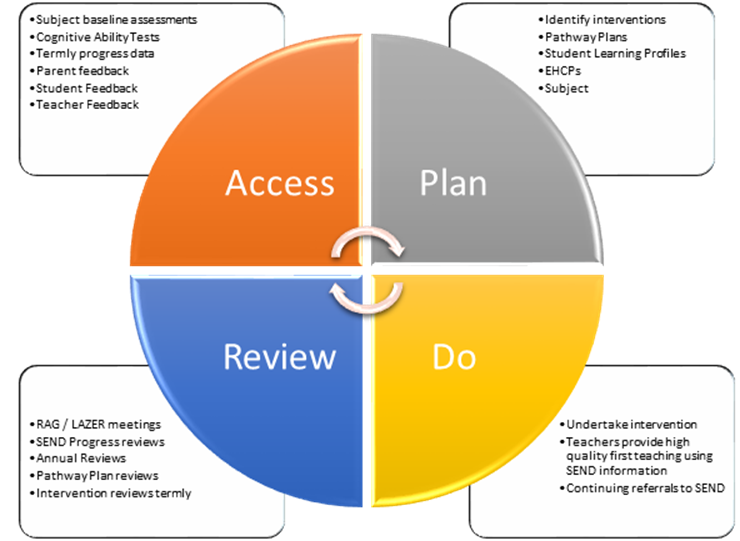 · Review: Following a systematic review schedule, the SENCO will monitor and review progress made by identified SEND pupils in conjunction with individual subject teachers and advise staff accordingly. Parents are encouraged to contact the SENCO should they have any questions and/or seek further information regarding this process. As part of the Local Authorities provision map every school is required to publish their school offer which outlines what provision if offered to SEND students. In addition to our provision map, the school’s SEN Information Report and SEN Policy can also be found on the school’s website. Ash Manor School recognises the importance of key transition times at set points during a child’s/young person’s educational career. A member of the senior leadership team holds overall responsibility for successful transitions from primary to secondary school and from secondary to post 16 provision. Networks are set up with different schools and post 16 provision to ensure the process is co-ordinated effective. Special consideration is shown to the transition from Key Stage 3 to Key Stage 4 provision and transitional arrangements for SEND pupils with Statements are identified in Annual Review meetings. The SENCO contributes to this process in conjunction with other staff. Ash Manor School is committed to support SEND pupils and their families during these transitional times and encourage parents to contact the school with any concerns relating to this. Our aim is to develop a partnership where professionals and parents work together in the best interests of the child. Ash Manor School recognises that positive attitudes, sharing of information, procedures and awareness of needs are all important. The views and wishes of the young person are also taken into consideration. Parents are informed when the school considers that a student’s needs are significant enough for them to be placed on the SEND register. The SENCO attends all Parents’ Evenings and is available then for consultation with or without an appointment.